A must for institutional traders as it allows them to react quickly when trading. The special Trader Keyboard was developed for TradeMaster, which provides perfect support especially for algorithm and scalper traders. The Trader Keyboard allows for extremely fast reactions and perfect trading. Positions can be opened with the stroke of a key. Limits set, positions shifted, closed or breakeven stops set. 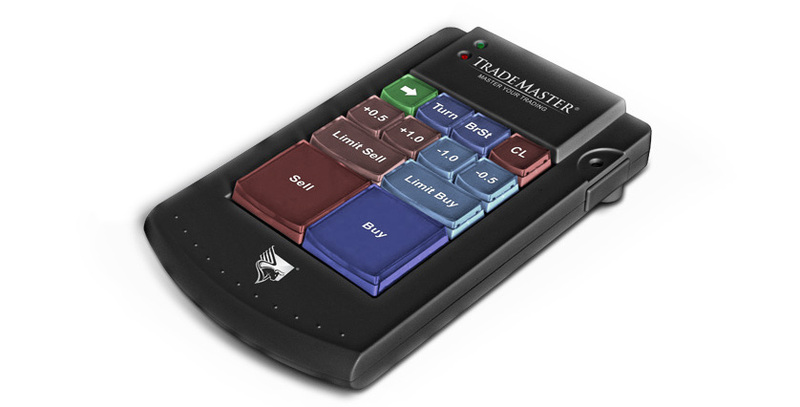 The Trader Keyboard comes pre-programmed and can be simply connected to your normal keyboard using a USB plug. The Trader Keyboard is available to new customers free of charge* and together with TradeMaster it will create a new dimension in exchange trading for your success! A key stroke allows you to enter a buy or sell position. Limit Sell / Buy This is the limit interval for the current market price. +0.5 bis -0.5 This is used to limit your trading entry by one pip or a half pip over the current market price. Arrow The Arrowbutton is for the quick selection of currencies. Turn This shifts your open position(s) with a keystroke to the opposite direction. A long position can be quickly shifted to a short position. Breakeven Stop Breakeven stop is available for your open position(s). Position safety is now possible with a keystroke. Close This will close out your open position(s) with a speed only available in the Trader Keyboard. Connections USB and alternative serial connections. Further specific additional settings can be installed on the Trader Keyboard. It is thus possible to place direct stops and limits on market orders using the Trader Keyboard. It allows traders to open a position with an additional stop and limit with a single keystroke. Every new customer who opens an active trader account of more than €10,000 will receive a Trader Keyboard free of charge.